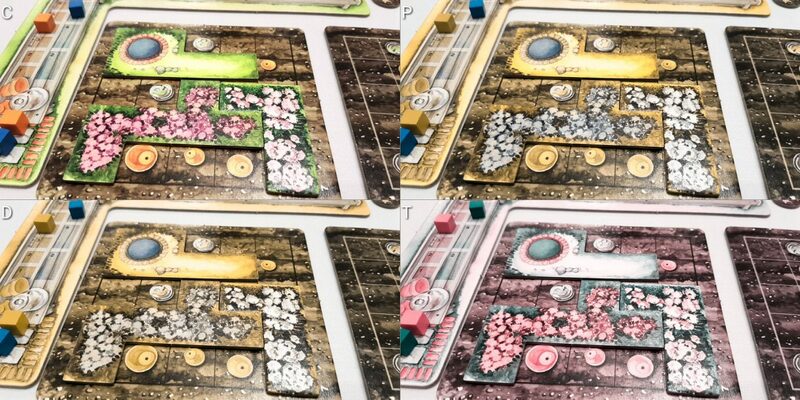 We gave Cottage Garden three stars in our review because in the end it’s hard to justify buying it in a gaming landscape that already contains Patchwork. Even if you need a game that supports more players, Barenpark represents a better investment of your time and effort. That’s especially true because Barenpark ends when it should rather than ten minutes after it’s all ceased to be fun. Still, there’s nothing actually hugely wrong with Cottage Garden. It just suffers in comparison with stiff competition. There’s still a chance for the plucky little contender though – maybe it’ll thrive in an accessibility teardown! Let’s plant some seeds and see what grows. Colour is a factor when it comes to appreciating the artwork, but has almost no bearing on the game otherwise. Pieces are differentiated by their size and shape, not colour. Even the scoring cubes are mostly fine because they present differently for all categories of colour blindness. In situations where monochromacy must be considered, they can be identified by the side of the track they occupy. Your plots are peppered with flowerpots and cloches, but these have a different visual design and in any case the colour palettes don’t overlap. They’ll also be right in front of you and so it’s not difficult to make out which is which. Assessing this on an opponent’s board is a part of play, but not critical to success. In any case, the colour choices should be fine for most players. The Nursery is the only other real game component, and the effect of colour there is only aesthetic. We strongly recommend Cottage Garden in this category. Were it not for the presence of the flower pots and cloches in semi-randomised configurations on each plot we might have been willing to make a case for Cottage Garden being fully playable, out of the box, in this category. This isn’t quite the case, but it could be modified to be so with the use of external tokens. For example, coins that someone places over the appropriate squares. That would require a sighted player’s support, and care would need to be taken when playing. That part of the game though would become fully playable since all pieces have a unique tactile profile. There are a few flower beds that come with their own flower pots, but accessible workarounds can be house-ruled for that too. Given how each of your plots are only five by five, it’s even the case that the puzzle in play would be tractable in a way that Patchwork does not necessarily permit. It’s much easier to feel for valid shapes in a small grid than a larger one because the implications don’t compound quite so significantly. For the nursery, the position of the gardener die gives a clear indicator as to what row or column is to be explored for available tiles, and each tile again can be differentiated by touch. 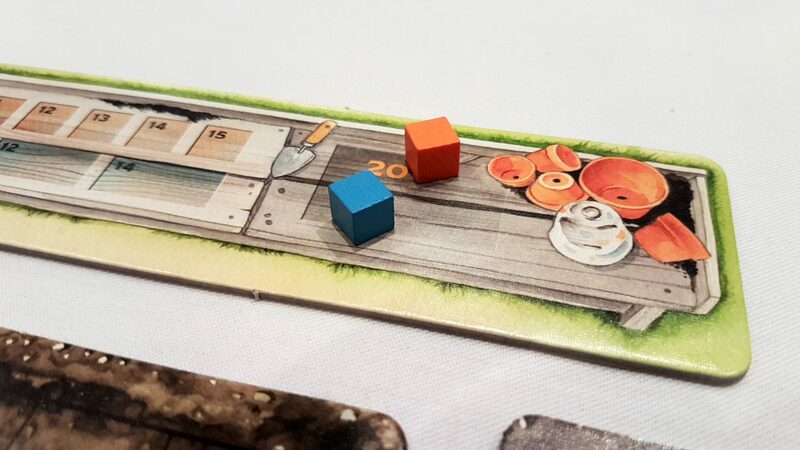 If necessary the gardener dice can be replaced with an accessible variant although this is likely to have an impact on how much space the game takes up. One of the more extravagant components in the game is a three-dimensional wheelbarrow that indicates the start of the external trail of pieces. That’s large, clunky and difficult to mistake when working by touch alone. So far, so accessible. However, there is a catch that comes in if people are playing Cottage Garden with a particular emphasis on the strategy of piece manipulation. The piece you pick now should be one that maximises your benefit and minimises that of an opponent and that requires a degree of planning ahead. You want to be able to limit a player’s options by taking pieces they would be able to grab at a later stage of the game, and that is much easier to do if you can see the nursery. It’s not necessarily impossible if that’s not straightforward, but there’s a chance that inquiring could leak a small amount of game intention regarding the way you’re planning to play. More importantly, knowing what pieces are appropriate for that is dependent on the board in front of other players. You could investigate that too by touch, but that’s likely to become cumbersome especially when larger player counts are involved. It certainly would be possible to play Cottage Garden as a game primarily of reacting to the choices in front of you rather than the ones in front of everyone else. I have my suspicions really regarding how feasible it would be to play it in the manner I describe above. It’s theoretically possible but full of so much uncertainty within a massive probability space. However, you also need to take into account the realities of skill for most players. I don’t doubt someone can become very good at Cottage Garden if they want, but I suspect most people won’t. As such, we’ll strongly recommend Cottage Garden in this category but bear in mind it’s going to depend on how aggressively everyone is planning to play. The weird scoring system is likely to be confusing if cognitive impairments are to be considered but it’s easy enough to work around it with some simple house rules. As an example, move one cube until it gets to the end, and then the next, and then the next. That limits the ability of a player to collect cats and hives, but certainly the latter of those can be omitted from the game with few problems. Their impact on the end game scoring is minimal. You could even omit the scoring entirely. If not, calculating the score requires a degree of numeracy but that can be handled by someone else at the table without difficulty. Much as with Patchwork, I’m minded to believe that most of the potential cognitive complexity in Cottage Garden is a smoke-screen. It looks like you can do a lot in terms of planning and plotting but I have strong doubts as to just how useful it is and how reliable it would be. Strictly speaking Cottage Garden is a perfect information game, at least as far as the flower beds go. 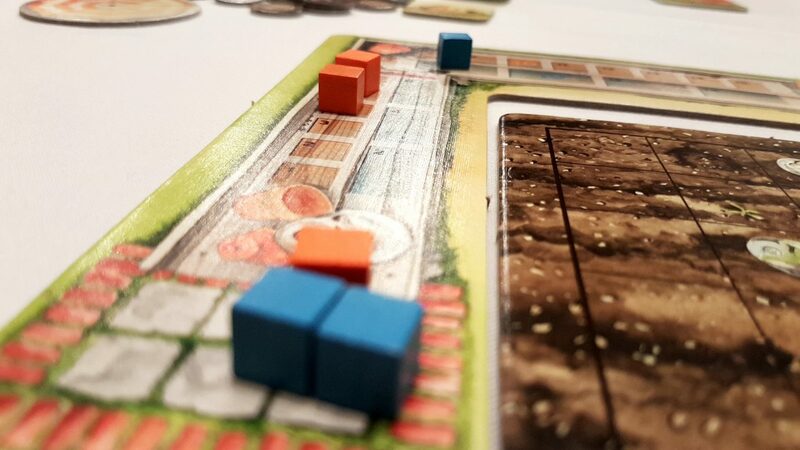 You know what flower beds are available, what will be available (barring other player choices) on your next turn, and what order and when the nursery rows and columns will be refilled. You get to choose the order in which recycled pieces enter the queue for that so in theory you can plan very far ahead for your gardens. The problem with that is that beyond looking a single move ahead there’s only so much you can do with that information, and the control that you personally have is far removed from its original point of relevance. If you choose to return pieces in a particular way to the nursery realistically you have no way of knowing if it’ll be useful to anyone when they finally make their way back into availability. Similarly if you take a piece that you think someone will want in a future round you may find that events overtake them because you push them down an equally effective pathway. The availability of cats and flower pots make it very difficult for you to cause real, lasting problems for anyone. I certainly wouldn’t disbelieve anyone that says they can make use of this mess of information to play with increased effectiveness. Theoretically it’s definitely possible and I can see some occasions where it would be useful. I just don’t think that’s going to be the case for everyone or that it’s even particularly necessary to play well. You can play Cottage Garden reactively without any real problems. As such the cognitive cost is relatively low for effective play. The good news is that all this information does wonders in the memory accessibility category. You don’t actually need to remember anything – it’s all arrayed in front of you. Really the main skill that Cottage Garden stresses is spatial intelligence, and I don’t think it taxes that particularly heavily either. The restrictions you have on placement are entirely consensual – you don’t need to keep flower pots and cloches uncovered if you just want to make a nice garden. If you’re playing with the full scoring context then that’s more of an issue, but even so the small boards and the multiple options you have available mean it’s not as difficult as you might expect. 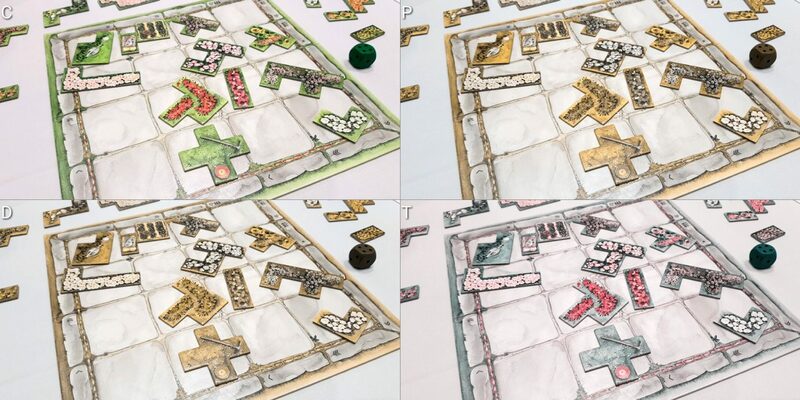 Cottage Garden even gets rid of the difficulty of an economy and the elasticity of turns that were a problem for Patchwork as far as its accessibility were concerned. We strongly recommend Cottage Garden in the memory category, and recommend it in the fluid intelligence category. Bear in mind though there will be a few things that might need house-ruled to fully meet its promise here. Cottage Garden has no direct competition – it’s all located in the indirect contention over flower beds in the nursery. There are in theory ways that you can deprive people of important tiles but you very rarely put them in a position where you’re seriously setting them at a disadvantage. After all, cats and 1×1 flower pots are quite an equalising force. The only area where I’d have some concerns is in the intensely punitive final round where every turn you take costs you a couple of points. When everyone is being penalised equally that’s fine but if they finish before you then you feel both victory slipping away and the pressure to complete your board or boards. This is usually only something that lasts a few turns at most, but it can add a sour taste at the end of the game especially if the difference between winning and losing would otherwise be slim. Score disparities tend to be quite small, and scores are never going to be negative unless something truly spectacular goes wrong in the course of play. Patchwork has score disparities that can be borderline antagonistic because of how the final results are calculated. Cottage Garden doesn’t have anything of the sort and is a much friendlier game as a result. 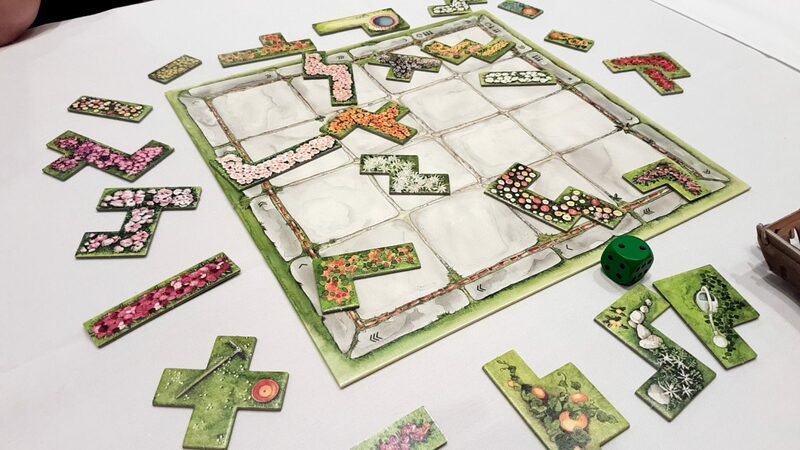 As with Patchwork, there is though an issue that those with a compulsive need for completion may find some discomfort in the gaps the game encourages people to leave in the garden. It’s not actually necessary, but you’re not going to score unless there are some pots and cloches still visible on the plot. As such, it’s entirely possible for someone to feel compelled to do themselves game disadvantage in order to fully complete the grid they have in front of them. If that’s not a problem, it’s unlikely Cottage Garden will pose serious issues in this category. We’ll strongly recommend it. Again, we can see here that many of the problems that were in Patchwork are eliminated by the design of Cottage Garden. We can’t avoid the simple truth that a game like this offers a certain degree of intrinsic satisfaction that comes from positioning pieces, and that has to be reflected in our recommendation. However, the relatively generous proportions of pieces and the relatively small size of the of the grid are a boon here. You’re not necessarily expected to slot pieces together – instead, they nestle against each other with room to wiggle. And if a hand spasm or tremor should dislodge a board it’s much easier to put it back together than it can be with Patchwork. Even the graph paper solution we discussed in Patchwork works better here because you can just colour in squares on a paper grid if physical manipulation of the board is too much. Verbalisation too is made much easier by the 5×5 grid, which reduces the number of feasible placement options and offers a more condensed format by which instructions can be relayed. There are more meaningful landmarks that emerge from the arrangement of tiles and pots. ‘Place a cat underneath the topmost flowerpot on the left’ as an example. We’ll recommend Cottage Garden in this category but bear in mind some of the fun here is just in arranging the pieces yourself in a satisfying way and there’s a danger that might be lost. There’s no requirement for literacy and no need for communication at all during the game. Humming the theme tune to the Beachgrove Garden while playing is thematic but not actually necessary. As such, we’ll strongly recommend Cottage Garden in this category. Each player receives a Planting Table on which he places 3 orange and 3 blue Scoring Cubes on the starting space. Then each player randomly draws 2 Flowerbeds, placing them next to his Planting Table, with one showing the light side and one showing the dark side. In addition, each player takes 2 Cats. 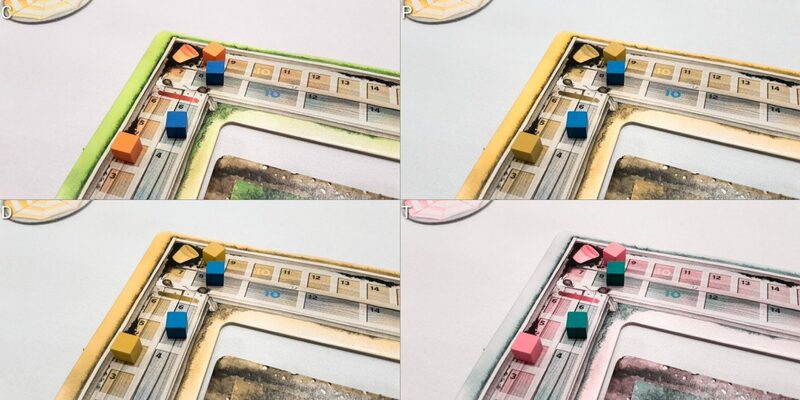 It’s not egregious because there is a shift in style that happens almost immediately – it seems like this might be a leftover from an earlier draft of the manual but we review the game it comes in the box rather than what the intention would have been. In terms of cost, Cottage Garden has an RRP of £33 and while that is more than Patchwork it is also a game that supports twice as many players and has a robust solo mode. You get a lot of components for the money, and some of those components are especially extravagant – the wheelbarrow in particular is a lovely addition. It’s also a game I see on sale regularly often – currently you can get it for £28 and if cost was the only factor I certainly wouldn’t shy you away on that basis. Given what you get in the box it’s hard to fault. We’ll recommend Cottage Garden in this category. I have two significant reservations here. The first is that those for whom there is an intersection of visual and cognitive factors, the need to hold a mental model of the available tiles will radically alter the accessibility profile. Likely to the point of complete inaccessibility. There’s just too much that would need to be memorised to make it feasible, and too much fluid intelligence in applying that model to the game state in front of any individual payer. Similarly those for whom there is an intersection of visual and physical accessibility will find their main information source in the game is cut off – this is true whether the physical issue is precision, gross motor movement, or even sensitivity of the fingers. You’d need to be able to feel for the arrangement of pieces and whether they are likely to fit on the board, and you’ll need to do this over a considerable amount of game state. Cottage Garden takes up a substantial amount of table space and this is likely to be an issue with this intersectional category. The play time in Cottage Garden tends to be around the hour mark, although shorter games are certainly possible. In my experience it tends to drag on in the final rounds, but really the play time is highly configurable. The face showing on the gardener dice is the current round and so you can just start it from a higher face if you want a shorter game. Indeed, that’s what’s expected in the two player game. Play isn’t especially intense in any case, and mostly what you do on your turn is just pick a piece and place it. As such, there isn’t really a worry here – you can scale the play time to your comfort level and take regular breaks while other people take their turn. If a player needs to drop out it’s straightforward to do, and the game can even reasonably support dropping down to a single player with a few house rules. 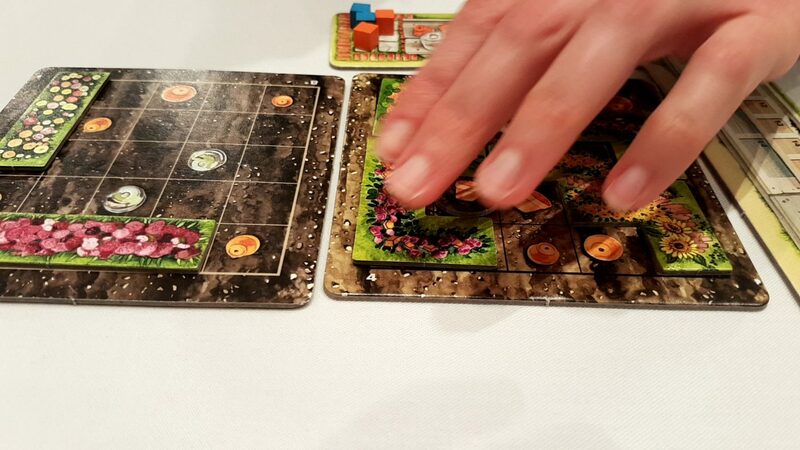 Well, Cottage Garden may be hard to recommend too enthusiastically in terms of game design, but it’s a clear favourite if accessibility is your key concern. There’s a very strong performance here across every category. As is usually the case, some of these recommendations come with caveats and the expectation of house rules being applied. It’s difficult to raise too many objections though against a game that manages to do so well here. A few minor slip-ups could have been avoided here and there, but by and large this is a game we could recommend to anyone. Sometimes the role of a game on Meeple Like Us is not for us to say everyone should get it because it’s awesome, but to say ‘If you like the look of X but can’t play it, perhaps Y might be more appropriate?’. I’d rather play Barenpark or Patchwork over Cottage Garden, but if I had to recommend an accessible polyomino position simulator to you the chances are very high it would be Cottage Garden that got that nod.